This is the wiki-hosted FAQ for Bit Heroes. If you can't find the answer you need, or if you find an error, please leave a comment below. If you have questions for the developer, post them on the official forums. Z1F1 is 'zone 1 flag 1', and refers to the first flag in Bit Valley. Z1D1 is 'zone 1 dungeon 1', and refers to the first dungeon in Bit Valley. 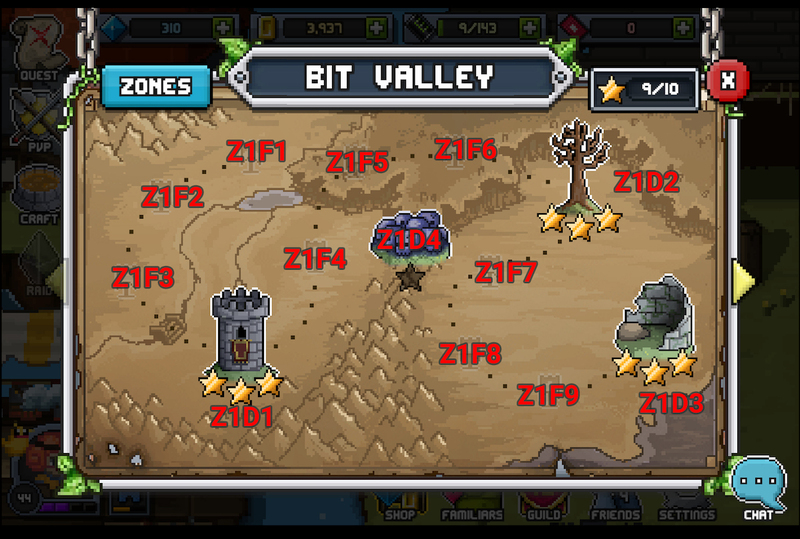 Z1D4 is 'zone 1 dungeon 4', and refers to the secret dungeon in Bit Valley that appears when you gain 9/10 stars (complete each dungeon on every difficulty). Zone 1 Imgur image guide. T1-T8 is the level of all equipment and mounts, which are further broken down by quality: common, epic, legendary, etc. T# can also refer to the Trials/Gauntlet difficulty group which drops the above equipment. T### is sometimes used to refer to the difficulty level in Trials/Gauntlet, e.g. T70 or T110. R1 is the Astaroth raid (drops T4 equipment). R2 is the Kaleido raid (T5). R3 is the Capt. Woodbeard raid (T6). R4 is the XL-OMBIS 400 raid (T7). R5 is the Zol's Labyrinth raid (T8). Orlag Clan (5 Players) and Netherworld (3 Players) in classic difficulties. Total combination of Power, Stamina and Agility. Players fight against groups of familiars (fams) to advance in the game. Fams may join a player through persuade or bribe. Fams may be fused with other fams or MATERIALS to create more powerful fams. Quality is higher than common/rare/epic, but lower than set/mythic/ancient. Your name as it appears in the game, not as it appears in a chat room. They are difficulties in Dungeons, Raids and World Boss. Difficulty: "Special" (dungeon only) > "Heroic" > "Hard" > "Normal"
For example "I got a Leg dupe" means "I got a legendary duplicate". 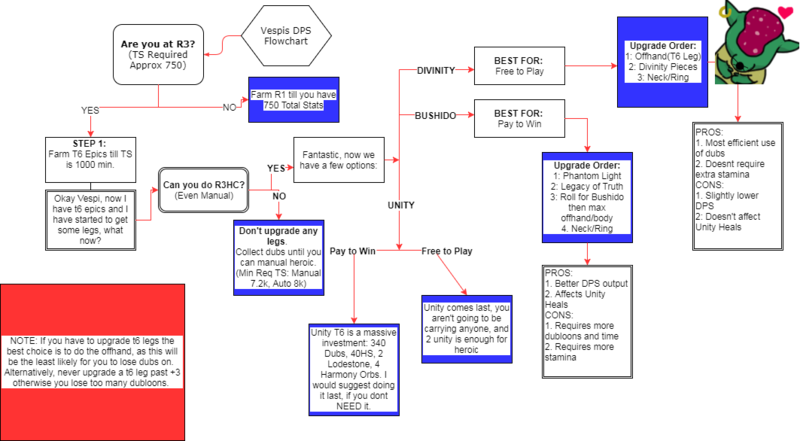 Schematic is required for fusion. The word RNG usually refers to a person being either very lucky or insanely unlucky. It is commonly used by gamers and people in the social networks referring it as a compliment to him/her. RNGesus is derived from RNG, it means "The deity responsible for situations that are determined largely by luck, chance, or randomness in online games". This is a non-comprehensive list of guides written by the community. Each room has its own core group and culture. Respect the norms. 'Listen' for a bit before 'speaking' until you get the hang of the room. DON'T USE ALL CAPS FOR YOUR 1ST 10 MESSAGES, THEN... don't, just don't. Try to ask your question in one post, not ... over ... several ... posts. Thank those who give you good information/advice. Learn common abbreviations and acronyms. If you type /help into a chat window, it will give you a list of commands. /help - This brings up a full list of commands. /clear - This clears the chat. /view X - If you replace X with a player's in-game name, it will bring you to their profile. Single letter commands also work. For example, /h functions the same as /help. Zones are the areas accessed through the map icon labeled "QUEST" on the main page. Bit Heroes currently has eight zones: Bit Valley, Wintermarsh, Lakehaven, Ashvale, Aramore, Morgoroth, Cambora, and Galaran. Flags and dungeons are found within each zone. Flags are the mini-dungeons represented by flag images on the map, and can only be completed once. You can only play with familiars (not other players). Dungeons normally have three levels: NORMAL, HARD and HEROIC. You gain a star for completing each level of difficulty for the first time. Once all visible flags and dungeons are fully completed a new hidden (one star) dungeon will appear. It will have the bosses and familiars from each previous dungeon within it. You may play with familiars/fusions, members of your FRIENDS list, and guildmates. PvP is unlocked after clearing the 2nd dungeon in Z1, (Dryad's Heart) in Bit Valley. Invasion and Guilds are unlocked after clearing the 4th flag in Z1, (flag 4) in Bit Valley. GvG and Expedition are unlocked after joining a guild. Trials & Gauntlet are unlocked after clearing the 3rd dungeon in Z1, (Lord Cerulean's Tower) in Bit Valley. World Boss is unlocked after clearing the 3rd dungeon in Z2, (Gemm's Cell) in Wintermarsh. Raid 1 is unlocked after clearing the 3rd dungeon in Z3, (Quirrel's Fortress) in Lakehaven. Raid 2 is unlocked after clearing the 3rd dungeon in Z4, (Kov'alg Pit) in Ashvale. Raid 3 is unlocked after clearing the 3rd dungeon in Z5, (Tealk's Palace) in Aramore. Raid 4 is unlocked after clearing the 3rd dungeon in Z6, (Moghur's Catacomb) in Morgoroth. Raid 5 is unlocked after clearing the 2nd dungeon in Z7, (Vedaire Thicket) in Cambora. Raid 6 is unlocked after clearing the 2nd dungeon in Z8, (The Trilogy Chamber) in Galaran. Your maximum energy increases by 1 per level. For easy calculation, your maximum energy should be 99 + PLAYER LEVEL. For more information, see Daily Bonus, and/or How do the dungeon bonuses work? Are they additive or multiplicative? Disable auto pilot on death: Automatically turns auto off if any teammate (including yourself) dies in-combat. Ignore boss: Ignores the boss in the dungeon/raid if you are playing on auto. Ignore shrines: Ignore HP and SP shrines if you are playing on auto. Show helm: hide/unhide helmet. If you hide your helmet, other players can see you without your helmet. Show mount: hide/unhide mount. If you hide your mount, other players can see you without your mount. Friend requests: Forbid others from sending you friend requests. You can still invite others to be your friend. Duel requests: Forbid others from sending you duel requests. You can still request duels. World Boss Requests: Forbid friends, guild members, or others from sending you WB requests. You can still request WB events. Auto pilot: Lets you toggle auto ON/OFF outside of dungeons and battles. Auto enrage: Disables Enrage from being automatically used. Video ads: Hide/unhide the icon to watch video ads for free stuff (PvP tickets, gems, energy). Reduced effects: Turning this on will disable white flashes on text and units in battle, as well as particle effects. Battle text: Hide battle numbers/text during combat. You will no longer be able to see how much damage you deal or receive. Overlay status bars: Overlay HP/SP bars above the characters. This is useful in 5-man raids where accessories can hide the health bar. World chat: Hide/unhide chat. You stop receiving world chat messages and world chat notifications. You will still receive guild and private messages. Fusion: Hide/unhide fusion animation during fusing new familiar. Victory: Hide/unhide victory animation during battling. Battle: Hide/unhide battle animation (attacking, healing, etc.) during battling. Decline duplicate familiars: Automatically decline familiar prompts if you already own at least 1, if you are playing on auto. Decline merchants: Automatically decline merchant offers in dungeons if you are playing on auto. Decline treasures: Automatically decline red chests in dungeons if you are playing on auto. Anyone gets a legendary, set or mythic equipment/mount/familiar/schematic for the first time. Anyone upgrades a piece of set equipment. Someone on your friends list logs in. Someone on your friends list gets an epic equipment/mount/familiar/schematic for the first time. Anyone gets legendary or set (if applicable) rune/enchant/materials. Anyone gets a new set equipment from set chest. Anyone gets a new cosmetic item. Someone on your friends list pick up skeleton key or epic rune/enchant/materials. Turn on 'Video Ads' in settings, and disable AdBlock/uBlock if playing in browser. If you are using Google Chrome, install the separate Adobe Flash plugin, and disable the Chrome built-in Flash player. You get a new ad every 10–15 minutes. The 15 minute counter resets if you reload the game. Ads give 3-6 or 10 Energy, 1 PvP ticket, or 4-6 gems. If you disconnect mid-dungeon, and have not met the clear requirements yet, you will resume playing. 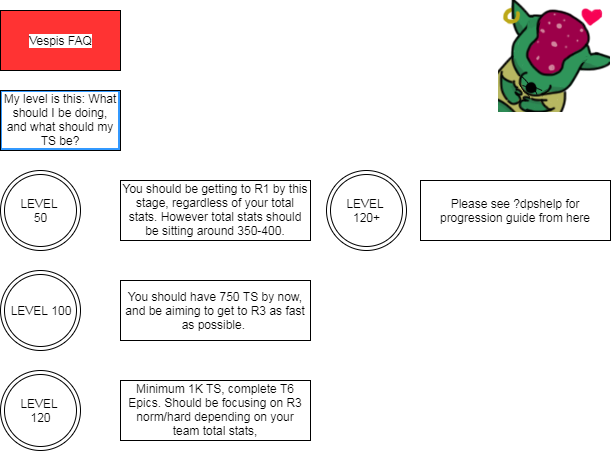 If you have already met the requirements for clearing the dungeon (e.g. already killed boss), you will return to town. If you disconnect mid-fight, the game will complete your fight on auto, and the above two statements then apply. For example, if you disconnect during PvP, the game will auto the rest of the fight for you, and you will gain PvP points accordingly. The same applies to Gauntlet. If you disconnect during a dungeon or raid boss fight, you will return to town on reconnection. See Booster Pack for details. Every mob in Bit Heroes can be caught or built. You just need luck and persistence. It can take you several runs in a dungeon to get a prompt to catch a base familiar. The chances of the prompt appearing is determined by the capture rate. See Familiars for a list of all the familiars in the game, as well as their locations. No. If you have 'Decline dupes' turned on in settings, you will lose the chance to persuade familiars you already own, but you will still be prompted for familiars you have 0 of. Fusion schematics drop according to the familiars they represent, with one exception. Zombie & ninja fusion schematics only drop in Invasion mode, regardless of their contents. See List of fusions by location for a visual guide. Power, Stamina, and Agility are the player's base stats, and are used for calculating the player's total stats, health bar, and overall damage output.
) calculates the damage the player/familiar can deal. Each point in Power represents 1 damage.
) calculates the player/familiar's health points. Each point in Stamina represents 10 health points.
) is used with Power to calculate the player/familiar's combat speed. For every turn the player/familiar receives, the player/familiar regenerates 0.5 skill points(SP). Health represents how much health the player/familiar has. A health bonus is applied in-combat. Evade negates damage from incoming hits. The base evade chance for players and familiars is 2.5%. Block halves incoming damage. Block Critical is a block proc on an enemy's critical hit. Deflect lets the player/familiar avoid damage, as well as return the evaded damage to the enemy. Deflected hits can be blocked, evaded, deflected again, redirected, etc. There is no limit on the number of times damage can be deflected. Redirect causes an attack directed at another player/familiar to redirect to the player. The redirect proc is calculated prior to other defensive procs (e.g. deflect/evade), and damage can be redirected multiple times if multiple players in a party have a chance to redirect damage in their direction. There is no limit on the number of times damage can be redirected. Shield creates an additional health bar over the player's existing health. Shielding is capped at 50% of the player's base HP. Absorb transforms all of the damage received into shielding. Absorb is calculated prior to damage reduction. Damage Reduction reduces all damage received by a given percentage. Damage Enrage stores a percentage of damage received as a bonus, up to 10% of the player/familiar's HP. On use, the bonus 'enrages' the next ability, increasing its potency at a one-for-one point value. Team Enrage works like Damage Enrage with the bonus collected for each team member as they are hit. The bonus is collected for only you, not your team. Damage represents how much weapon damage/healing the player/familiar can deal. The damage bonus is applied in-combat. Speed represents how many turns the player/familiar can have relative to their enemies (not movement speed!). A speed bonus is applied in-combat. Critical Chance represents how often the player can cause a critical hit. The base critical chance for players and familiars is 10%. Critical Damage represents the damage multiplier when a player deals a critical hit. The base critical damage multiplier for players and familiars is +50%. Life Steal heals the player/familiar for a set percent of the damage the player/familiar deals. Dual Strike automatically recasts the same skill the player/familiar last chose. If the skill last chosen is a target enemy skill the target with the lowest hp will receive the second hit. Prior to this the player was offered the choice to pick a new target. If the skill last chosen is a backrow attack, and the backrow enemy dies from the first hit, the new backrow enemy will be targeted. Empower Chance doubles the damage or healing of a skill. Quad Strike cast the same skill 5 times. Ricochet Chance (not listed in player info) allows a projectile to jump between existing enemies, dealing the same damage (prior to damage reduction) to another random enemy that are hit. Ricocheted hits can be blocked, evaded, deflected, redirected, ricocheted again, etc. There is no limit on the number of times damage can be ricocheted. Currently only Trugdor's Call (3/3) set bonus, Agony (4/4) set bonus, Arsenal (2/4) set bonus, and mythic laser gun are available. Damage Return causes the enemy to take damage every time they hit the player/familiar, for a set percent that scales with the damage taken. Damage closest (x) damages the closest 1, 2 or 3 enemies depending on specific skill ability. Damage target damages the selected enemy. Damage weakest damages the enemy with the least absolute health. For example, this skill will target a 50/50HP enemy over a 55/100HP enemy. Damage furthest damages the furthermost enemy. Damage Random damages a random enemy. Damage Random (Ricochet) will hurt a random enemy and then bounce to other enemies. Damage All damages all enemies. Drain health damages an enemy (or enemies) and heals for the exact amount of damage that is dealt. For example, if Olxaroth drains 120hp from 4 enemies, Olxaroth will be healed for 480hp and each enemy will lose 120hp. Heal self heals the caster alone. Heal target heals the selected ally. Heal all/teamates heals everyone in a party for X. For example, Gemmi will heal ~100 to every member in the party regardless of their current HP. Spread heal heals a party for a summed total of X based on lowest health percentage if the skill does not allow a target to be selected. If the target is healed to max hp the remaining healing amount will be redirected to the player/familiar with the lowest health. 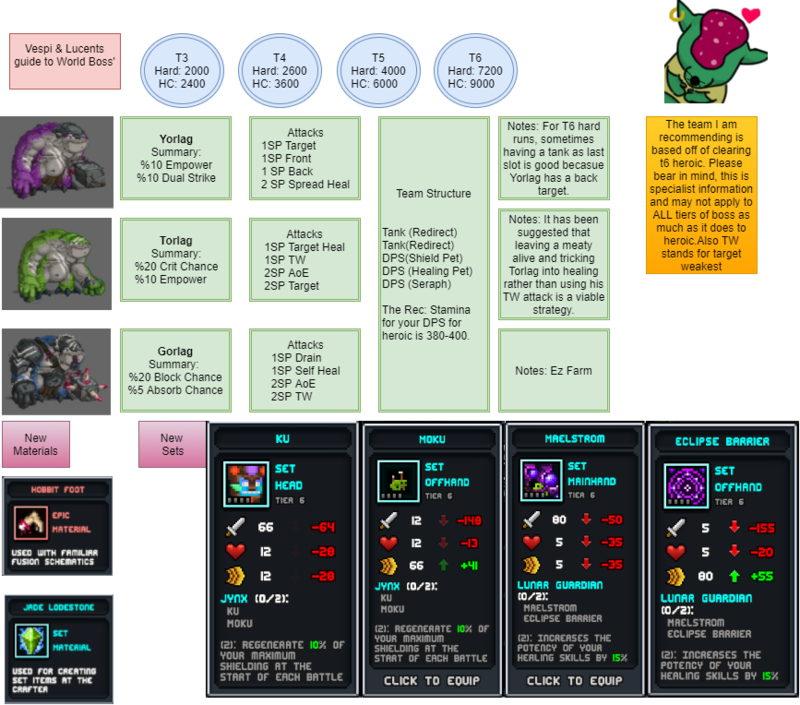 For example, Squibbo will heal 200 on the player and another 100 on itself, for a total of 300hp. See below for enhancement items (Runes and Enchants). Mounts can be obtained from event rewards or through Trading mounts in the Craft menu. Mount guts are obtained from PvP, Trials/Gauntlet and Invasion event rewards. Most anywhere. See the Equipment page for details on ALL equipment. Trials/Gauntlet - Yellow-coloured brackets Tier 4-8. Trials - mini-bosses (bigger versions of normal enemies) or the main bosses. Raids - R1/R2/R3/R4/R5 Bosses (Astaroth, Kaleido, etc. ), Loot goblins (Olxa, Mimzy, etc. ), Epic chests, The merchant (for 1,000 gems apiece). Trials/Gauntlet Teal-coloured brackets - Tier 5 (100-109), Tier 6 (140-149), Tier 7 (200-209), Tier 8 (340+). Heroic Raids - R2/R3/R4/R5 (rumoured to be boss drop only). Heroic World Boss - T6/T7/T8. Trials/Gauntlet Magenta-coloured brackets - Tier 7 (200-209), Tier 8 (340+). Heroic Raids - R4/R5 (rumoured to be boss drop only). Heroic World Boss - T7/T8. Guild Shop - Spending guild honor. Event Rewards - win or do well in events. Runes can be obtained from event rewards or through Trading rune fragments in the Craft menu. Rune fragments are obtained from PvP, Trials/Gauntlet and Invasion event rewards, as a login gift, as a reward from daily bounties, watching an ad chest in dungeon, and from exchanging runes. See the Runes page for more information. No. Your equipped accessories and runes only affect your player character. You gain 1 energy every 4 minutes. You gain 1 ticket every 45 minutes, for a maximum of 10. You gain 1 token every 45 minutes, for a maximum of 10. You gain 1 shard every 120 minutes, for a maximum of 4. You gain 1 badge every 45 minutes, for a maximum of 10. Guild Perks can increase the natural regeneration cap of all resources other than energy. See Guilds for more information. +50% gold find bonus while playing on Sunday.
) can be bought from Shop, they increase the gold gain for 24 hours each, but they doesn't stack, using another one replaces the old one. Use small energy potions from the daily bonus and daily bounties. Trade bronze and silver PvP coins for 20 energy. Buy Average energy potions from the Guild shop for 15k Honor each. Corundum Ingot (WB7 Netherworld) are obtained from exchanging Set items, and are used for re-rolling Set items in Trade. A Set item yields its respective set tier material when exchanged. See Craft#Exchange for more information. are classified in-game as an Epic Currency. The following are rough guidelines that do not account for any specific builds. The TS is based off of your character's TS, not the group TS. R1 Heroic needs friends at least 700 TS to clear without auto. R2 Hard needs friends at least 950 TS to clear without auto. R2 Heroic needs friends at least 1200 TS to clear without auto. R3 Normal needs friends same as R2 Hard (950 TS). R3 Hard needs friends same as R2 Heroic (1200 TS). R3 Heroic needs friends at least 1500 TS to clear without auto. R4 Normal needs friends about 1300 (manual) to 1400 (auto). R4 Hard needs friends about 1700 TS to clear without auto. 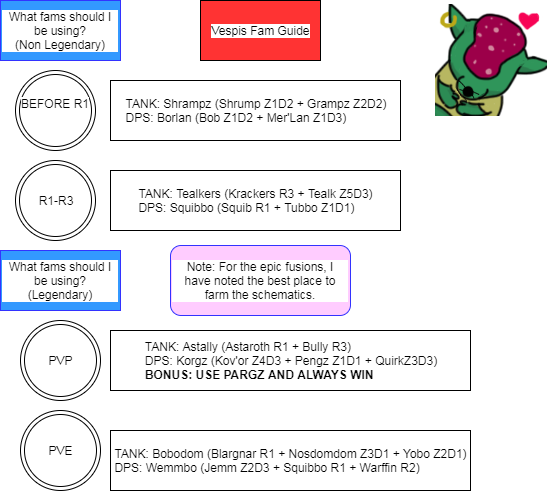 R4 Heroic needs friends about 1900 TS to clear without auto. 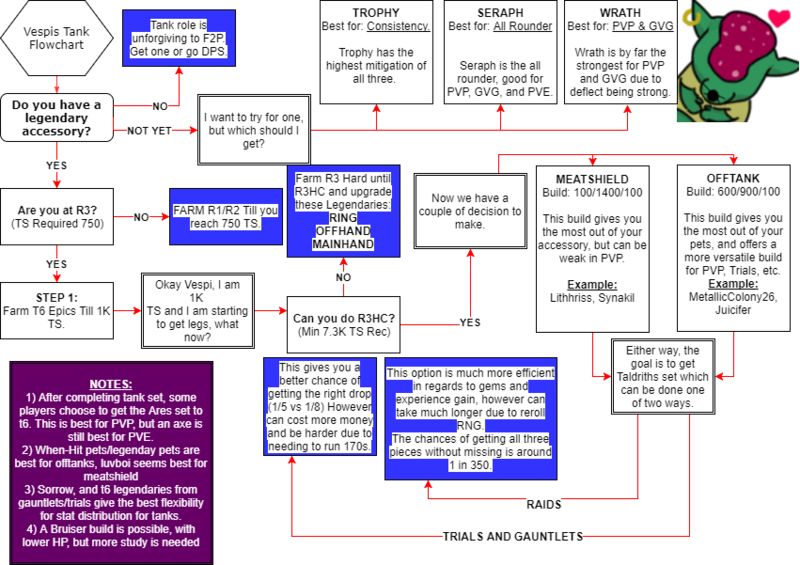 This is a handy chart totalling the stats of all equipment drops based on rarity. For detailed upgrade stats, see the Total Stats page. For details on specific equipment, see the Equipment page. R1 is Raid 1 (Astaroth's Awakening), see Raids for more information. R2 is Raid 2 (Hyper Dimension), see Raids for more information. R3 is Raid 3 (Woodbeard's Booty), see Raids for more information. R4 is Raid 4 (A Haile of a Mistake), see Raids for more information. 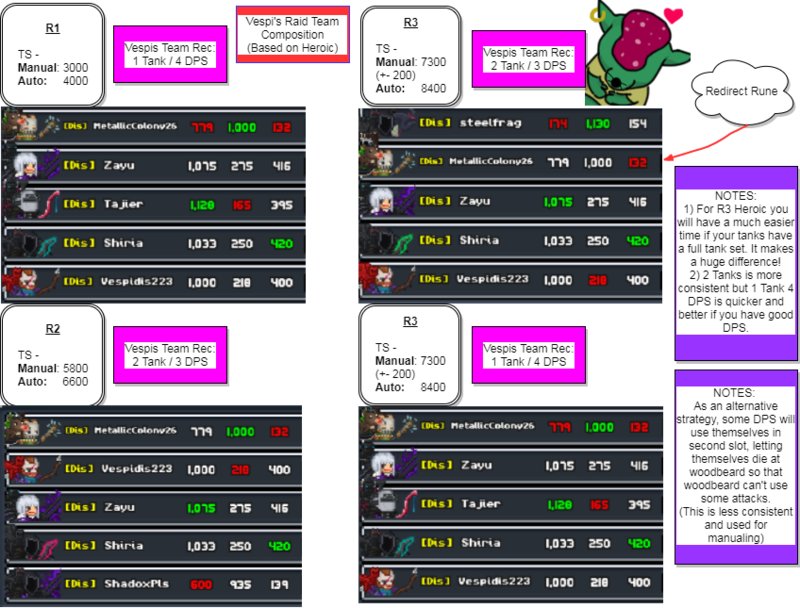 R5 is Raid 5 (Zol's Labyrinth), see Raids for more information. Item Find increases the quality of the drops obtained by the player. However, certain items are on different loot tables and may not be affected by item find. Here is what we do know. Stat-carrying Equipment dropped in Zones, Raids, and Trials. Crafting materials: jumbo syrum, mini syrum, robot sprockets, wet brainz, ninja powah. No. Gauntlet and Trial difficulty tiers now reflect the highest possible rarity that can drop from that difficulty. However, the drop rate remains the same within a given tier. Say you have a +10% Minor EXP rune slotted, and you're using a Minor EXP tome which gives +25% EXP. On top of that, today is Saturday, so you have a daily bonus of +30% EXP. The formula used for final bonus (100 [base rate] + Daily + Boosts + Runes + Guild Perk) * (dungeon bonus). The player bonus is comprised of your daily bonus, boosts, runes, and guild perk. Summed together, that's a player bonus of +65% EXP. Heroic dungeons give +200% EXP, or a total of 300% EXP. so that's the dungeon bonus. The game multiplies the player's total EXP gain with the dungeon bonus when calculating the final bonus. In our example, you would be receiving (100% + 65%) * 300% EXP, or a final bonus of 495% EXP. In the example provided by the developer, a Major Item Find Scroll and the Friday daily bonus is 150% item find. If entering a heroic dungeon with +200% item find (or 300% total item find), the final bonus would be 750% item find. This can be seen via the formula, where the player has 100% base rate, 150% player bonus (hence 250% total item find), and this is multiplied by the 300% dungeon bonus for a final bonus of 750% item find. The same logic applies to capture rate and gold find. ↑ Not to be confused with Stat Point, which permanently increase your total stats by 1. ↑ Damage Enrage replaced Damage Return. ↑ As of 6/8/2018, Quad Strike now adds 4 additional attacks, up from 3.